ElastiCache is a distributed in-memory cache environments in the AWS Cloud. 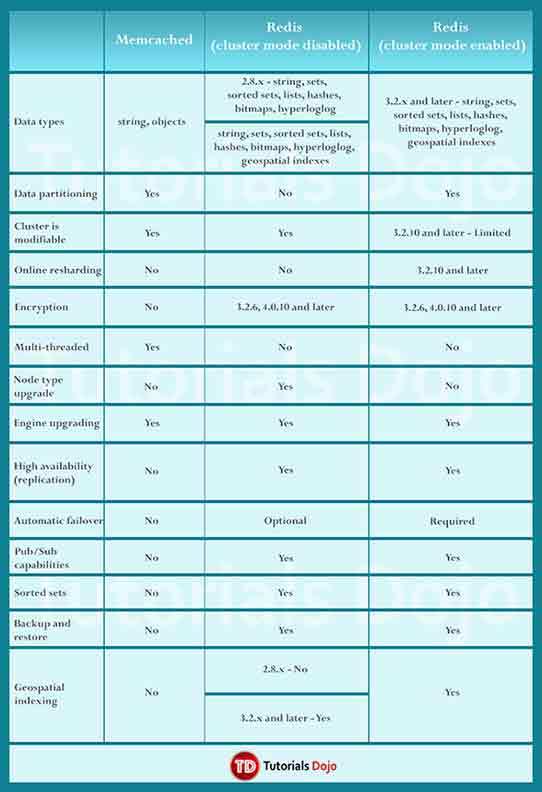 ElastiCache works with both the Redis and Memcached engines. A node is is a fixed-size chunk of secure, network-attached RAM. A node can exist in isolation from or in some relationship to other nodes. Every node within a cluster is the same instance type and runs the same cache engine. Each cache node has its own Domain Name Service (DNS) name and port. If a maintenance event is scheduled for a given week, it will be initiated and completed at some point during the 60 minute maintenance window you specify. Elasticache can be used for storing session state. Existing applications that use Redis can use ElastiCache with almost no modification. Redis supports in-transit and at-rest encryption with authentication so you can build HIPAA-compliant applications. Can be used as a datastore. Redis sorted sets guarantee both uniqueness and element ordering. Each time a new element is added to the sorted set it’s reranked in real time. It’s then added to the set in its appropriate numeric position. In the Redis publish/subscribe paradigm, you send a message to a specific channel not knowing who, if anyone, receives it. Recipients of the message are those who are subscribed to the channel. Redis hashes are hashes that map string names to string values. Redis Shard – a grouping of one to six related nodes. A Redis (cluster mode disabled) cluster always has one shard. A Redis (cluster mode enabled) cluster can have 1–90 shards. A multiple node shard implements replication by have one read/write primary node and 1–5 replica nodes. If there is more than one node in a shard, the shard supports replication with one node being the read/write primary node and the others read-only replica nodes. 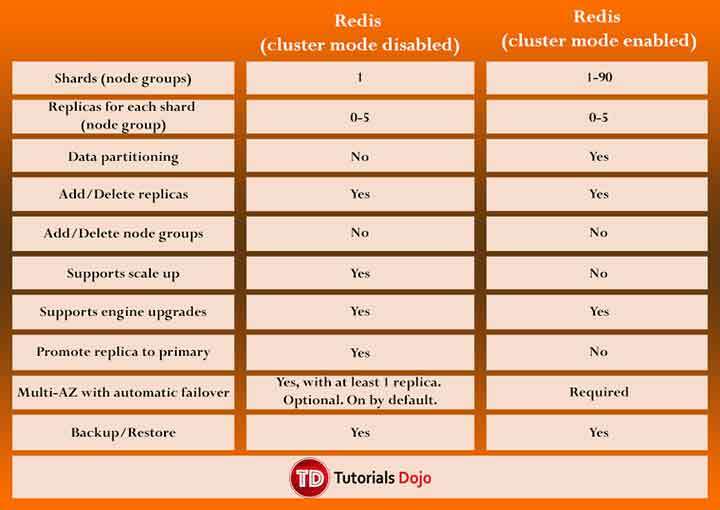 Redis Cluster – a logical grouping of one or more ElastiCache for Redis Shards. Data is partitioned across the shards in a Redis (cluster mode enabled) cluster. For improved fault tolerance, have at least two nodes in a Redis cluster and enabling Multi-AZ with automatic failover. Replica nodes use asynchronous replication mechanisms to keep synchronized with the primary node. If any primary has no replicas and the primary fails, you lose all that primary’s data. You can use backup and restore to migrate to Redis (cluster mode enabled) and resize your Redis (cluster mode enabled). You can set up automatic snapshots or initiate manual backups, and then seed new ElastiCache for Redis clusters. You can also export your snapshots to an S3 bucket of your choice for disaster recovery, analysis or cross-region backup and restore. Single Node Redis (cluster mode disabled) Endpoints – used to connect to the cluster for both reads and writes. Multi-Node Redis (cluster mode disabled) Endpoints – use the primary endpoint for all writes to the cluster. The read endpoint points to your read replicas. Redis (cluster mode enabled) Endpoints – has a single configuration endpoint. By connecting to the configuration endpoint, your application is able to discover the primary and read endpoints for each shard in the cluster. Cache parameter group is a named collection of engine-specific parameters that you can apply to a cluster. Parameters are used to control memory usage, eviction policies, item sizes, and more. 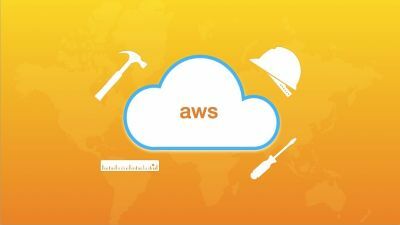 ElastiCache for Redis node access is restricted to applications running on whitelisted EC2 instances. You can control access of your cluster by using subnet groups or security groups. By default, network access to your clusters is turned off. By default, all new ElastiCache for Redis clusters are launched in a VPC environment. Use subnet groups to grant cluster access from Amazon EC2 instances running on specific subnets. ElastiCache for Redis supports TLS and in-place encryption for nodes running specified versions of the ElastiCache for Redis engine. A point-in-time copy of a Redis cluster. Backups consist of all the data in a cluster plus some metadata. ElastiCache Auto Discovery feature for Memcached lets your applications identify all of the nodes in a cache cluster and connect to them. ElastiCache node access is restricted to applications running on whitelisted EC2 instances. You can control the instances that can access your cluster by using subnet groups or security groups. Supports large nodes with multiple cores or threads. Memcached cluster – a logical grouping of one or more ElastiCache Nodes. Data is partitioned across the nodes in a Memcached cluster. Memcached supports up to 100 nodes per customer for each Region with each cluster having 1–20 nodes. When you partition your data, use consistent hashing. Endpoint – the unique address your application uses to connect to an ElastiCache node or cluster. Each node in a Memcached cluster has its own endpoint. The cluster also has an endpoint called the configuration endpoint. ElastiCache parameter group – a named collection of engine-specific parameters that you can apply to a cluster. Parameters are used to control memory usage, eviction policies, item sizes, and more. ElastiCache allows you to control access to your clusters using security groups. By default, network access to your clusters is turned off. A subnet group is a collection of subnets that you can designate for your clusters running in a VPC environment. If you create a cluster in a VPC, then you must specify a cache subnet group. ElastiCache uses that cache subnet group to choose a subnet and IP addresses within that subnet to associate with your cache nodes. Spread your cached data over more nodes. Because Memcached does not support replication, a node failure will always result in some data loss from your cluster. Locate your nodes in as many Availability Zones as possible. In the unlikely event of an AZ failure, you will lose the data cached in that AZ, not the data cached in the other AZs. ElastiCache uses DNS entries to allow client applications to locate servers (nodes). The DNS name for a node remains constant, but the IP address of a node can change over time. Lazy Loading – a caching strategy that loads data into the cache only when necessary. Only requested data is cached. Node failures are not fatal. There is a cache miss penalty. Write Through – adds data or updates data in the cache whenever data is written to the database. Data in the cache is never stale. Write penalty vs. Read penalty. Every write involves two trips: A write to the cache and a write to the database. By adding a time to live (TTL) value to each write, we are able to enjoy the advantages of each strategy and largely avoid cluttering up the cache with superfluous data. The service continuously monitors the health of your instances. In case a node experiences failure or a prolonged degradation in performance, ElastiCache will automatically restart the node and associated processes. ElastiCache provides both host-level metrics and metrics that are specific to the cache engine software. These metrics are measured and published for each Cache node in 60-second intervals. Monitor events with ElastiCache Events. When significant events happen on a cache cluster, including failure to add a node, success in adding a node, the modification of a security group, and others, ElastiCache sends a notification to a specific SNS topic. Memcached is designed for simplicity while Redis offers a rich set of features that make it effective for a wide range of use cases. With on-demand nodes you pay only for the resources you consume by the hour without any long-term commitments. With Reserved Nodes, you can make a low, one-time, up-front payment for each node you wish to reserve for a 1 or 3 year term. In return, you receive a significant discount off the ongoing hourly usage rate for the Node(s) you reserve. ElastiCache provides storage space for one snapshot free of charge for each active ElastiCache for Redis cluster. Additional backup storage is charged. EC2 Regional Data Transfer charges apply when transferring data between an EC2 instance and an ElastiCache Node in different Availability Zones of the same Region. The maximum number of nodes across all clusters in a region. You can have up to 100 reserved nodes and 100 non-reserved nodes in the same region. The maximum number of nodes in an individual Memcached cluster. The maximum number of nodes in an individual Redis cluster. You must also specify the instance type with your request. The maximum number of nodes in an individual Redis shard (node group). One node is the read/write Primary. All other nodes are read-only Replicas. The maximum number of shards (node groups) in a Redis (cluster mode disabled) cluster. The maximum number of parameters groups you can create in a region. The maximum number of subnet groups you can create in a region. The maximum number of subnets you can define for a subnet group.